By late 2017 after an unending streak of failed treatment I was close to making peace with my illness. One night in October 2017 I was 18 hours into a migraine. I had woken up with the headache and it worsened throughout the day. It was now midnight and the pain was peaking. I consumed no food and hardly any water all day, but still the nausea was so severe that I was bent over the toilet vomiting bile for the 4th or 5th time. On my way out of his office I shook Dr. Peled's hand and said, "Thank you, you gave me a new life." During this same three year period of monastery-living my migraine episodes became much worse. There were certain awful stretches at the monastery where every other day I would have 10/10 headache episodes with nausea and vomiting. As a result my headache pain became a main focus of my meditation. I would use my breathing to explore the pain and bring myself relief. During this time I came to know the topography of my headache pain like the back of my hand. On the surface a migraine headache might seem to be composed of one monolithic blob of pain that descends from thin air onto the head like a black rain cloud. But with my meditation I realized that actually there were certain spots in the back of my neck, eyes and temples that were like little cel-towers that radiated pain outward. There was one trigger point in particular that was especially bad. It was on the back of my neck in the vicinity of my right lesser occipital nerve and it almost constantly radiated headache pain. 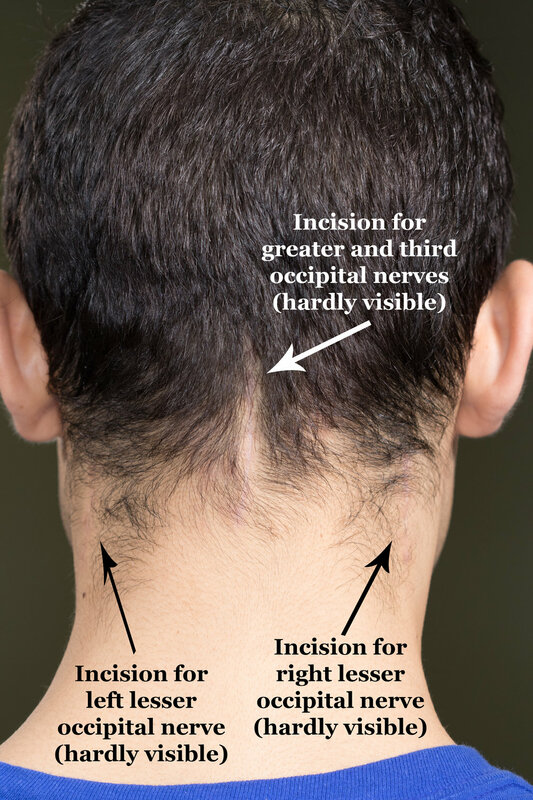 During surgery Dr. Peled discovered that the source of this trigger point was my genetically abnormal right lesser occipital nerve which had 3 branches instead of 1 (the normal amount), all of which were severely compressed. Surgery would also reveal that I had severe compression to my greater and third occipital nerves which corresponded to some other trigger points I had felt for years. I pressed my finger into my worst trigger point on the right side of the back of my neck: the area was numb and I felt no zing. Totally pain free. I tried my left side. Same thing–painless. Next I tried a few other hotspots in the back of my neck and they were all the same: numb and neutral. Dr. Peled decompressed my greater, lesser and third occipital nerves. All of these nerves are located in the back of the neck and back of the scalp. Since surgery I have had almost no headache pain at all in this region and I feel 85% better than before. In the temple is the zygomatico temporal nerve, near the side of the eye socket. And in the eyebrow and lower forehead are the supraorbital and supratrochlear nerves. Like the occipital nerves, these three nerves are common migraine-triggering culprits. I will most likely have a follow up migraine surgery with Dr. Peled in April to decompress my zygomatico temporal, supraorbital and supratrochlear nerves. I'm hoping that after this second procedure my headaches will be 100% cured. Recovering from migraine surgery has been smooth sailing for me. Before surgery I had read a lot of fear-talk about the recovery process. I found none of it to be true. I started massaging around my incisions on day 15 after taking my bandages off. The first time I massaged it felt like I was breaking up weeks worth of coagulated stiffness. The pleasure was amazing. That first massage I used extremely light pressure with just my finger tips–I wasn't sure if my incisions would reopen with too much force. Eventually I ended up with the following routine which I performed twice a day: first thing in the morning and last thing before bed. Massage your eyes, temples, and the rest of your scalp for good measure. You want to do everything you can to promote blood flow and awaken the nerves that have gone numb with surgery. Since the very beginning Cary-Anne has been patient and available and has made arranging the ins and outs of meeting with Dr. Peled a piece of cake. A practice manager can make or break a medical experience and Cary-Anne is fantastic. As a result he is able to offer an individualized approach to dealing with the the lesser occipital nerve during surgery. Unlike other migraine surgeons who always remove this nerve, no questions asked, Dr. Peled decides whether or not to perform a neurectomy on a case-by-case basis. If the nerve can be fixed he will do so and leave it in tact. The advantage of decompressing rather than severing the nerve is that sensation to the innervated area is preserved. 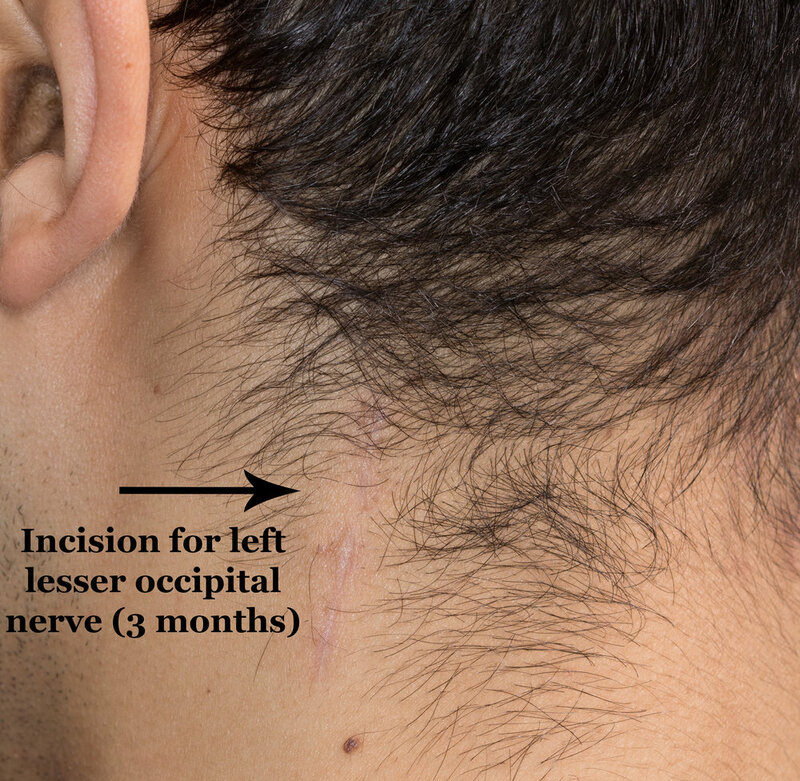 The patient keeps sensation in that part of their head or neck. Throughout this long appointment he was happy to answer any and all questions my parents and I had. His responses were all very thorough and very brilliant.